1. Clonmacnois. Detailed View. Cross of the Scriptures. West Face. 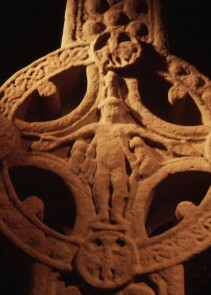 Cross Head. Crucifixion. Jesus is shown with his legs tied, wearing a lower garment only. His hands are clearly nailed. Stephaton offers vinegar while Longinus spears Jesus's side. There is an angel above Jesus head and a plinth/ suppedaneum beneath his feet. Edwards, Nancy, , ‘Some observations on the layout and construction of abstract ornament in Early Christian Irish Sculpture’. In Studies in Medieval Sculpture. Society of Antiquaries of London, Occasional Paper, ns 3 (1983) 3-17. Thompson, F. H., Studies in Medieval Sculpture. Society of Antiquaries of London, Occasional Paper, ns 3 1, , London (1983) . Guest, E.M., , ‘A Sheela-na-Gig at Clonmacnois’. In Journal of the Royal Society of Antiquaries of Ireland (1939) 69, 48. Westropp, T.J., , ‘Clonmacnois’. In Journal of the Royal Society of Antiquaries of Ireland (1907) 37, 329-340.